Ah, part two. If you’re just tuning in, this is the second of three bedrooms my sister and I organized and redesigned. You can read more background info here. This is Jack’s room. He is quite the sports fanatic including Cincinnati Red’s fan, UC Bearcats fan, water skiing champ (he’s only 6 but he had metals and trophies for water skiing!) and I’m sure more. His room needed an injection of sports personality, room to play hotwheels, display his trophies and bobble heads and a big kid vibe. 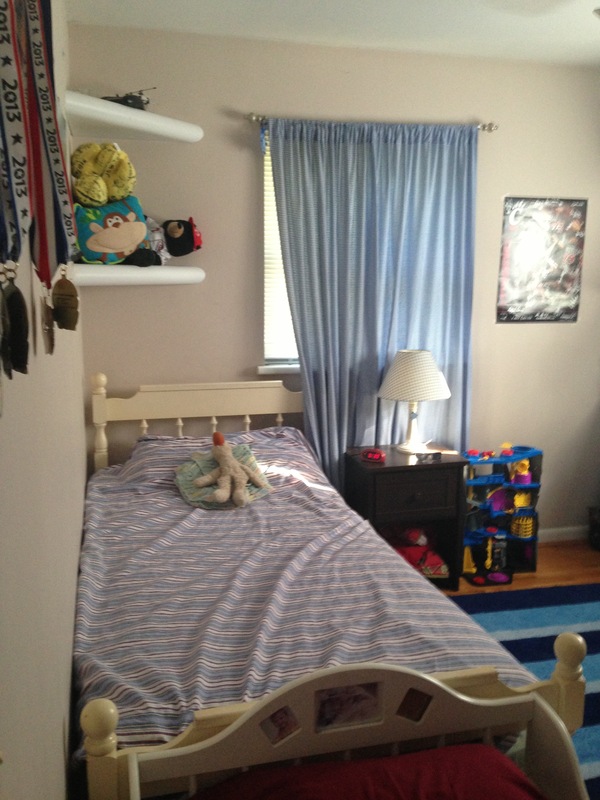 Built in shelves, blue and red bedding, blue gingham curtains, and a blue rug. The rug ended up finding a new home in Sam’s room. We loved his classic cream enameled bed! Jack just got a new dark dresser (LOVE!) so it was in the plans to stay. 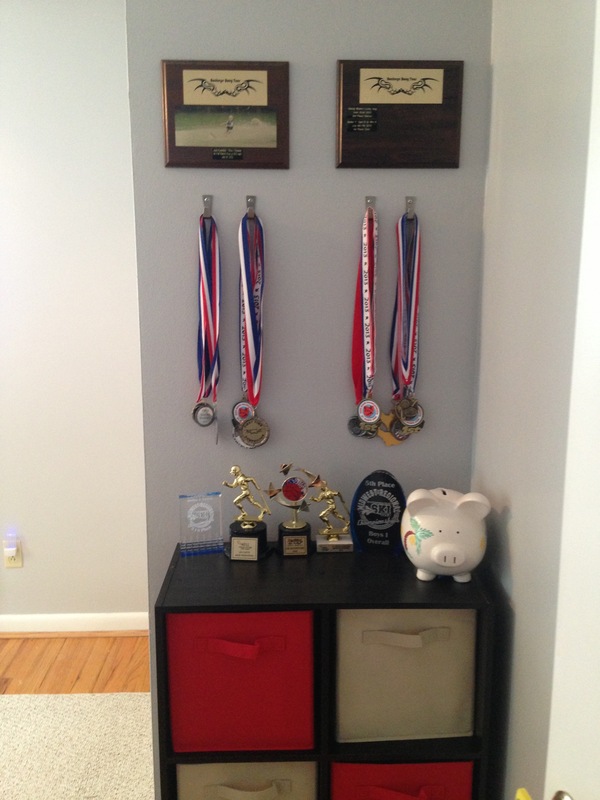 Those built in shelves were in another corner of his room too. He obviously used them but they could use some updating, right? 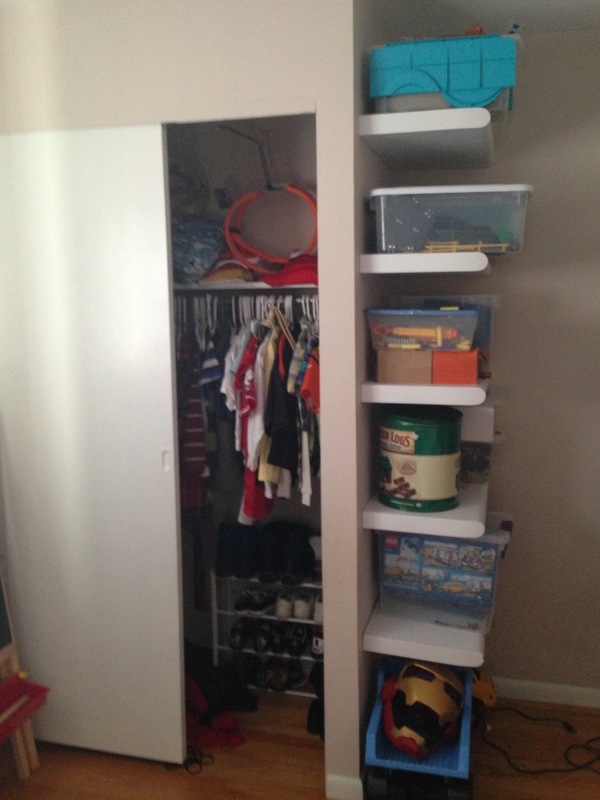 Jack’s closet needed a little love too and we wanted him to be able to store some of his sports gear in there so Susie did some rearranging. And what’s that… more built ins? It was going to be hard parting with all of this storage space but we had another solution in mind. 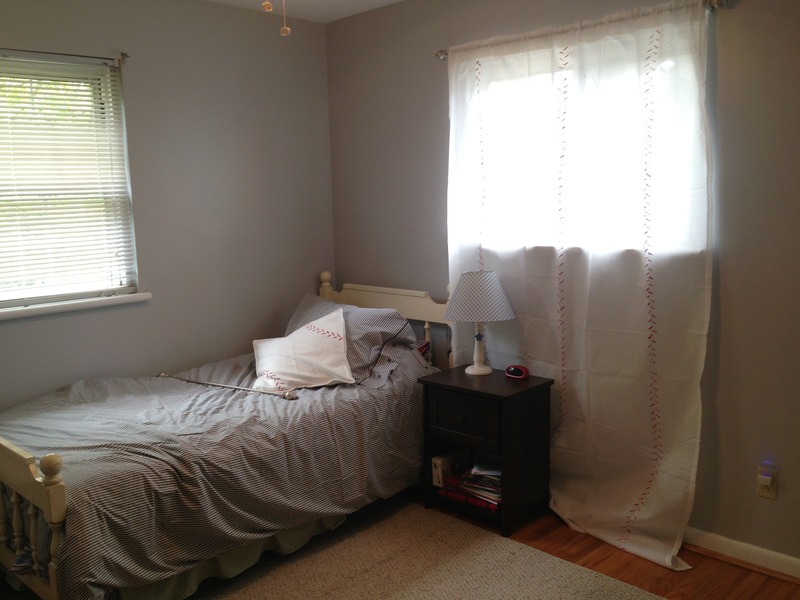 We planned Jack’s room to be neutral, soft gray with a slight sports infusion. No baseballs painted on the wall or anything. We wanted him to be able to change it to something else if he decided he was more into legos or planes or something else in the coming years. We painted the walls a soft gray. Then we hung Jack’s water skiing plaques and got hooks for all of those metals! Jack also got the same Closetmaid Cubical storage unit as Sam. We turned it vertically so that it fit against the small wall (on the end of his closet) that faced the door when you first walk in. Red and tan fabric bins tied in his love for the Reds and stayed away from being “in your face theme. This picture is before the final curtain was hung and bed wasn’t pristinely made yet… excuse our mess. We turned his bed to the opposite corner it has been in and I think it gives a more spacious feel when you walk in. We swapped out the striped rug for another beige one that Jack’s sister had in her room. His bedding is gray and white stripes reminiscent of a pinstriped baseball uniform from Ikea. We also found great under the bed storage bins for all of Jack’s Hotwheels race tracks. 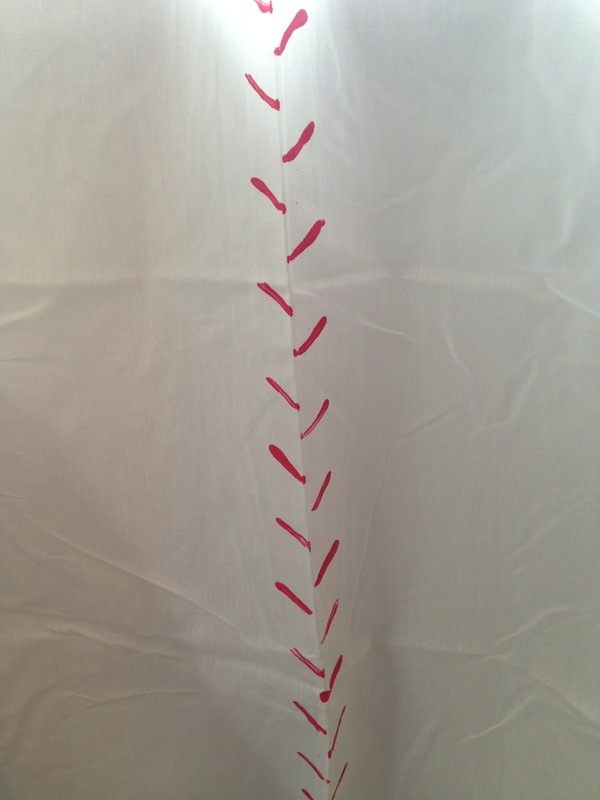 For the curtains and square accent pillow I used red fabric paint to stamp the “baseball stitch” pattern. Tutorial to follow. 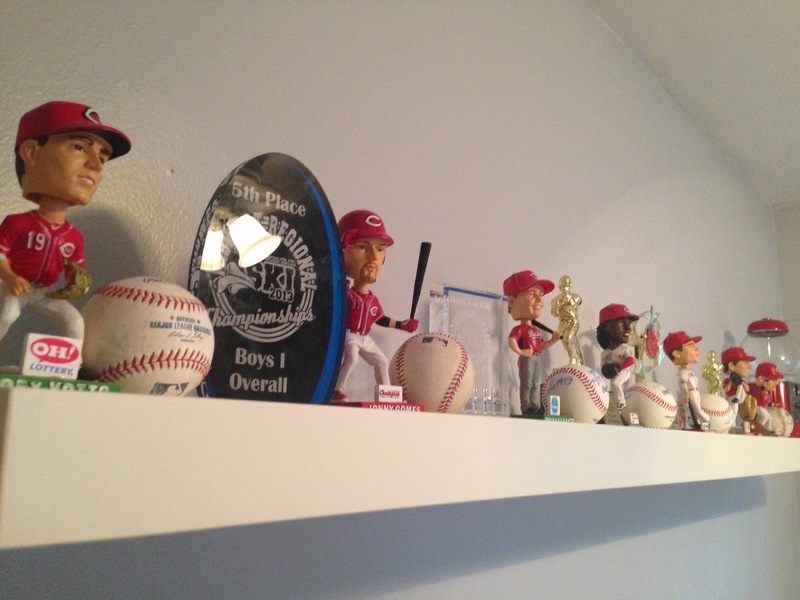 We hung a 6ft Ikea LACK shelf above his dresser to display Jacks’ bobble heads, autographed balls and trophies. 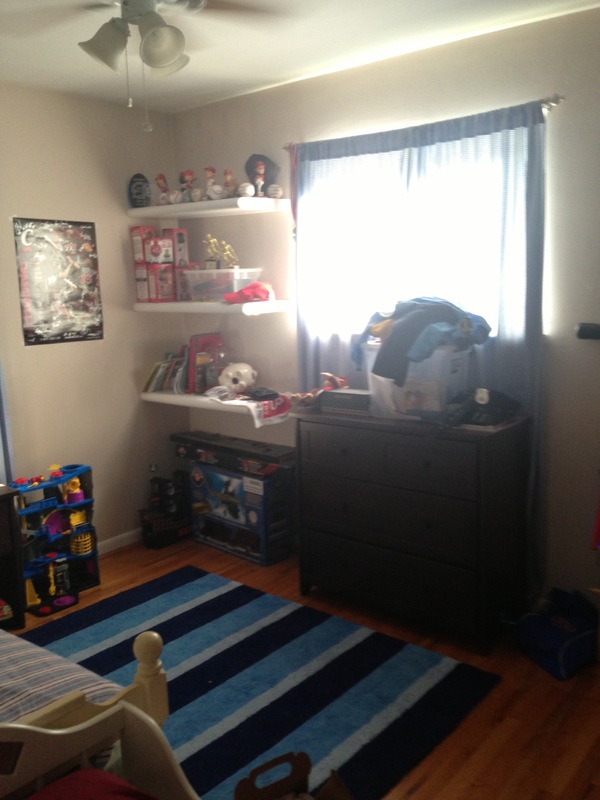 He also has a toy chest and some of his larger toys along the wall. In case you are trying to navigate where this is… this is the wall that his bed used to be against. 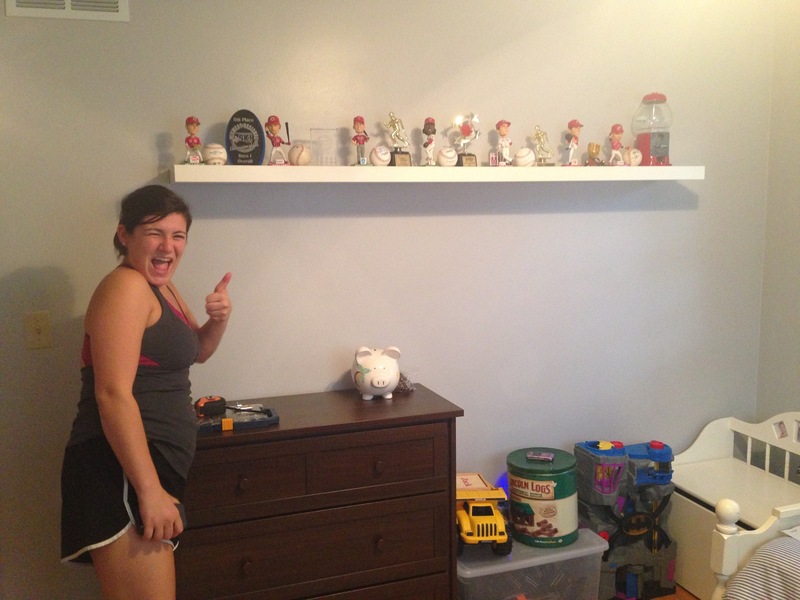 Susie is obviously excited about that shelf… it was her first go at hanging them with me. I had hung a few in my kitchen and I’m decently confident in my drilling abilities. I think Susie found her love for power tools in this project. She willingly posed for this shot and I told her it would be on here. Pretty sweet sports display shelf! And later Jack can use it for nearly any thing else. I anchored it with 8 screws and anchors (#4 drywall ones I believe). The shelf itself only comes with the wall bracket and you need to buy your own screws based on where you are hanging it. I used the #4 drywall screws at the recommendation of my friends at Home Depot. I also found a stud for 2 of the screws to anchor into (highly recommended). I heard that Jack LOVES his room and he keeps it organized and clean. Mom Heather is happy as well.